A Diesel Porsche For Sale in the US? UPDATE: The Porsche tractor in this post has been sold. However, this 1960 Porsche tractor Super Type 329 is for sale. 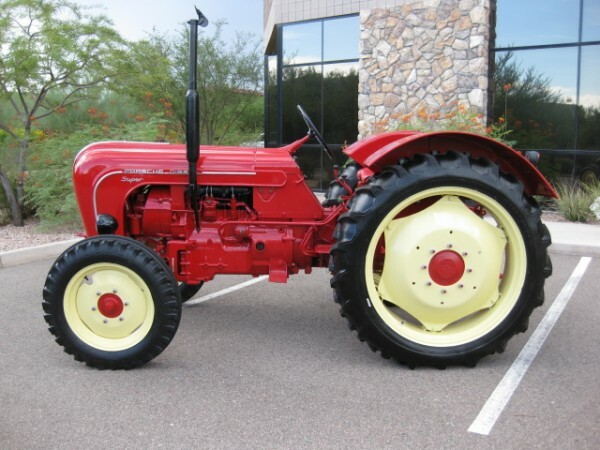 How's this for an eBay find; a 1960 Porsche Diesel "Super" Tractor L 138 for sale. Believe it or not, Porsche began thinking about tractors as far back as 1934 when he produced three petrol powered prototypes. However, because he never put them into production (in 1937 he was ordered by the German government to produce a "volks-tractor), he wasn't allowed to start his own production at the end of World War II. Not one to be outdone, Porsche signed licensing agreements with two different companies, Allgaier GmbH in Germany and Hofherr Schrantz in Austria. Respectively, using the Porsche engine design, these two companies produced the Allgaier System Porsche and the Hofherr Schrantz System Porsche. In 1956 Mannesmann AG wanted to enter the tractor market and did so by purchasing the license for the Porsche diesel engine and the Allgaier tractor design. Rebuilding and expanding an old Zepplin factory west of Friedrichshafen, Mannesmann created a modern manufacturing facility where the Porsche Diesel tractors were produced until the end of 1963. What's More Rare? A Porsche Tractor or a Porsche 356? It is believed that between the beginning of production in 1956 through the end in 1963 more than 125,000 Porsche diesel tractors came off the manufacturing line. In 1960, the year this particular Porsche tractor was built, it is thought that a total of 10,000 were manufactured. By way of comparison, there were 7,556 Porsche 356s built in 1960 with a grand total of 79,470 356s produced between 1950 and 1966. By simple math, the 356 definitely seems to be more rare. However, after some additional research, seems that only 1000 of the Porsche tractors were sold in the US by the American Porsche-Diesel Corporation. Of those 1000, approximately 300 of them are accounted for by the Porsche-Diesel North American Registry. For more details on this particular Porsche Tractor for Sale, check out the images and description on the ebay listing. How much you wants for sale the Porsche tractor? This Tractor is sold. Are you in the market for one? Where do you live? I am in the market for a Porsche-diesel. Do you have any or know of any for sale. Bob, we just sent you an email thinking you were in the market for a Cayenne. However, I know realize you’re talking about a tractor. Let me find out who can help you and we’ll be back in touch. I have a 1960 Porsche diesel standard I might want to sell . Do you know any Super for sale? Have you sold your Porsche tractor? Please send info and pics if you still have it? Just wanted to know if you have a Porsche tractor for sale or know of one for sale. i stay in Belgium,you can find Porsche tractors in Belgium and france,for a 3 cyl is the price 10.000 € and 5000 for a two and one cyl.last year i sold 32 Porsche to a german customer,there were 7 masters. I have a 1960 210 2 cyl Porsche tractor and a 1961 3 cyl Porsche tractor for sale. I just started the restoration of the 2 cyl today. They will both have new tyres and complete ground up restoration . Blasted back to bare metal and restored better than new. Many of our restorations are winning trophies Australia wide. We offer enamel, acrylic, or 2 pak paint. Customer can choose their paint. Will export Worldwide. Also have 1 cyl coming in soon. I’m in the market for a Porsche standard, are you going to have some to look at? Pics?